NOTE for 05.5 B7 S4 and some early 06 B7 S4: The 05.5 B7 S4 and the early 06 B7 S4 sometimes has the B6 S4 paper style gasket and pan, the VIN split has been inconsistent at times and doesn't match ETKA. If you have a 05.5 or early 06 please count the pan bolts to confirm. The B7 S4 has a rubber/metal style pan gasket with only 13 holes and is not interchangeable with the 23 bolt paper style pan gasket on the B6 S4 05.5 B7 S4 and some early 06 B7 S4s. These JHM Automatic Transmission Service Kits come with everything you need to service the transmission in your B6 S4 4.2l V8. You save money too! These Redline D4 kits are less expensive than the OEM fluid option and still meet the Shell M1375.4 standard as specified for this 09L 6-speed Automatic Tiptronic Transmission. Why service your Automatic Transmission?? Well like in a manual transmission an Automatic Transmission has a clutch, well actually multiple clutch packs. It has multiple friction plates in each clutch pack and multiple clutch packs in an automatic transmission. The problem with this is that just like a clutch in a manual transmission or brakes (another friction material), is that the material is worn off due to friction during each shift. With a manual transmission this just sits in your bellhousing and builds up as dust and with brakes it just builds up on your wheels and brake parts which is no big deal and doesn't wear any parts out prematurely. But in an automatic transmission where the clutches are covered in fluid the dust particles have nowhere to go, instead they get into the transmission fluid which the filter should technically filter out. However after roughly 40k to 75k miles the filter just can't collect any more dust particles or it just can't filter as well just like any other filter as it ages. Even though the fluid is ok, it just gets dirty. So you basically run dusty friction material through your transmission thus shortening its life. Even though with most new transmissions they say it uses a "lifetime" fluid and requires no servicing, in our experience we still see this dust and build up in transmissions we take apart. So why not clean this stuff out and get some fresh fluid in your trans along with a fresh filter. Keep in mind a new transmission is EXTREMELY expensive. The bottom line is, it is cheaper to keep clean fluid and a good filter in your transmission than replace it. With that being said, this won't make it last forever since it does have clutches that wear out, but at least it will protect your transmission bearings, seals and bushings from excess wear and get the longest service life out of your transmission as possible. JH Motorsports has put together this kit with all OEM parts and Redline D4 fluid. It includes an OEM Transmission pan gasket, OEM Transmission filter and 6 quarts of Redline D4 transmission fluid. Fits B6 S4s with the 6-speed Tiptronic Automatic Transmission and the 23 bolt paper style gasket. JHM recommends performing this service every 40k to 75k miles depending on driving style, conditions, etc. 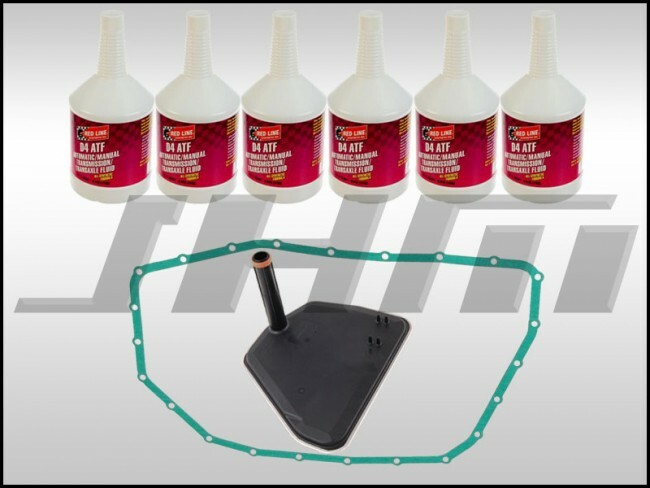 NOTE: The gasket in this kit is a paper style gasket with 23 bolt holes and fits USA transmission codes HHL, HHM, HLB and HKC in the B6 S4. If you have a late 05 B6 S4 and want to make sure you didn't get the B7 S4 style transmission in your car; it is safest to confirm the trans code or get under the car and count your bolts on your trans pan because the B7 S4 has a rubber/metal style pan gasket with only 13 holes and is not interchangeable with the 23 bolt paper style pan gasket on the B6 S4. Audi is famous for having bleed overs that are not documented in their parts interchange software. The total fill capacity of this 6-speed transmission is 9 liters (9.5 quarts). However, if you are just pulling the pan to do a trans service (drain and refill) it usually takes 5 liters (5.3 quarts) that is why we supply 6 quarts in this kit. If your car has been apart for a while due to drain back from the converter this can require 1 to 2 more quarts, we have seen as high as 7.4. If you were replacing the valve body at this time as well plan on needing up to 7 liters (7.4 quarts). If you were installing a new torque converter or new transmission you would most likely need 7.5 to 9.5 quarts since the torque converter holds almost half the fluid. So if you need more fluid we sell it as well in this section. Write up on how to perform this service coming soon.